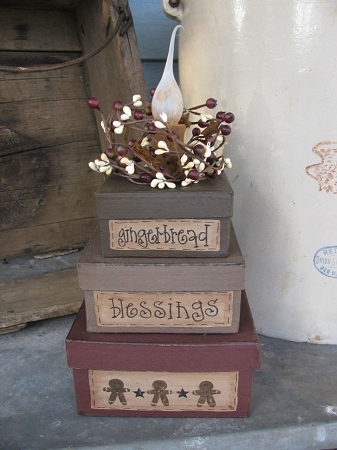 Primitive Country Gingerbread are a great country prim kitchen accent! 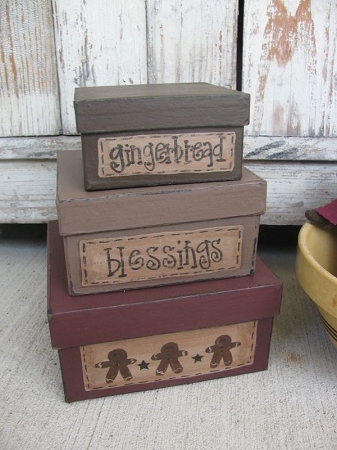 These boxes would work for year round display if you collect/decorate with gingerbread year round or a warm winter display piece for your kitchen! They have been hand painted in warm rich colors or milk chocolate brown, dark taupe, and burgundy. The labels are hand painted on and inside either display the hand painted gingerbread or the hand wrote saying. The saying is your choice too. Displayed is Gingerbread Blessings. Also, to add another thought, you can choose to your stack boxes, attached to one another and a electrified prim candle added on top. See additional photos of an example. Please choose your options below. Size of the boxes as pictured is 8" h x 6". With light it becomes 11" high. Hand painted, designed and signed by Heidi.